Testing and measuring of the amps delivered results as expected. The power output before clipping is about 25W. They drive my Haigner Rho speakers to quite remarkable levels and deliver a very deep and solid bass. Everything else is also very nice, beautiful midrange and great highs with fine resolution. Not quite on the level as the big 4 chassis version. But that was expected and is acceptable at around half the cost. Here some photos of the amps in operation. These 211 tubes give off a lot of heat! They are running at about 75W plate dissipation. In addition their filaments consume another 32W each! And there are the rectifier tubes at the back which also take their share of power. 13-14W heater power each and a couple of Watts plate dissipation. These amps guarantee a cosy atmosphere during winter nights! And the sound they produce will perfectly complement this! 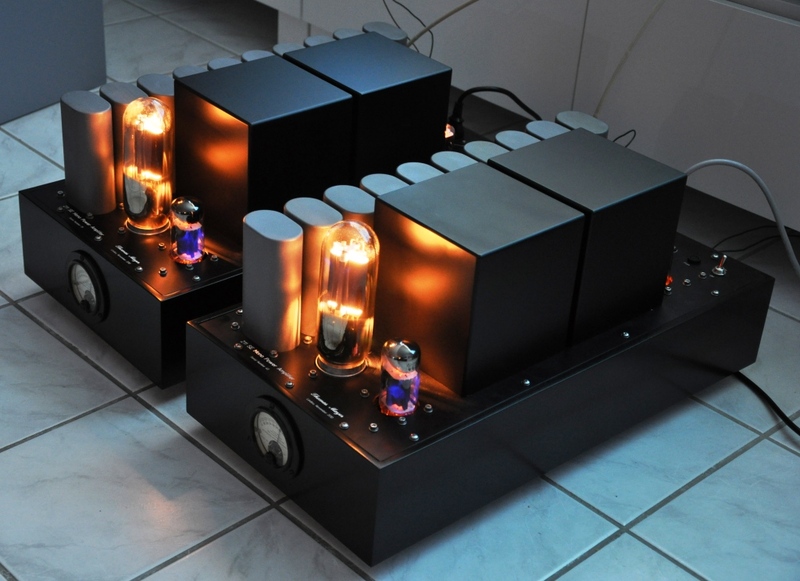 Although these amps are meant as scaled down versions, they are still impressive in terms of size and weight. They also sound like this, quite authoritarian. They take control of the speakers. The high step down ratio of the output transformers enables this. Some more shots of the amps in the dark. The plates of the 211s seem to glow on these photos, but this is only because of the long exposure time. They are perfectly fine. Also the blue glow on the glass of the 6HS5 driver tubes is perfectly normal. The plate current indicators stay rock steady at just a bit above 60mA. 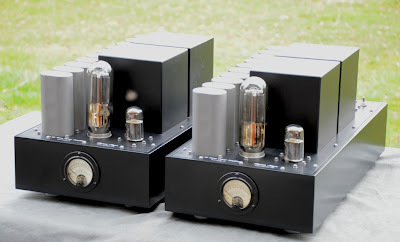 These amps came out really nice and were worth the effort. But my back hurts from carrying these beasts around. The next projects will be some low power SETs again. Another 45 is planned as well as an amp with the 46 dual grid tube. Stay tuned! 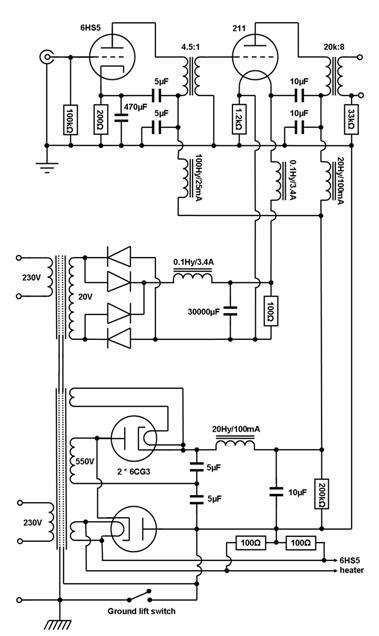 The first article about this amp outlined the decision process which let to the circuit design and parts choice. Now after the circuit design is done the assembly can start. The amp shall get a chassis in the usual style. All parts mounted on a metal plate which will be inserted into a wooden frame. In order to design the metal plate, the arrangement of the parts needs to be found. Easiest way to do this is simply placing the parts and rearrange them until the result looks good. The biggest parts will be mounted on the upper side of the plate, capacitors, B+ mains and output transformer and of course the tubes. The transformers will be placed under metal covers. Some trials let to the arrangement as pictured on the left. A row of capacitors, 10 in total. These pretty much determine the length of the chassis (more than 50cm). Signal tubes besides each other in the front, the rectifier tubes behind the two transformer covers. All input and output connectors and switches in a row on the back side. 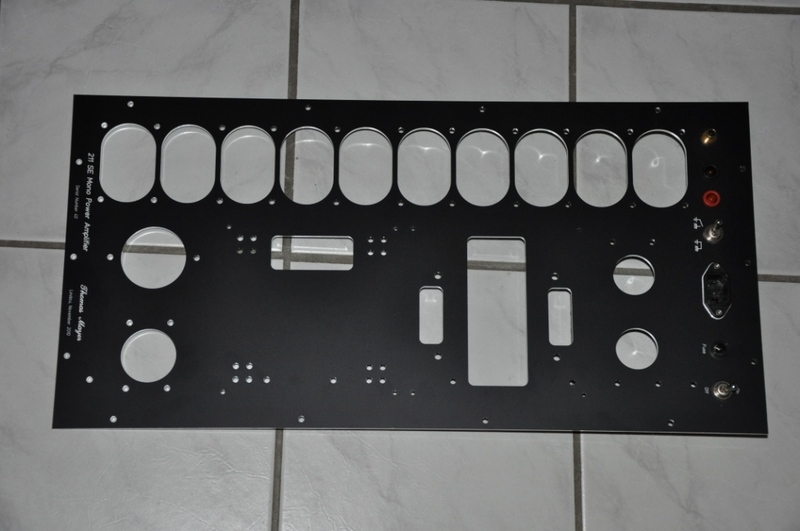 The plate already comes with all holes for the screws which are needed for mounting the parts and to fix the plate later in a wooden frame. In the photo, speaker terminals, RCA and mains inputs, fuse holder and switches (on/off and ground lift) are already attached to the plate. 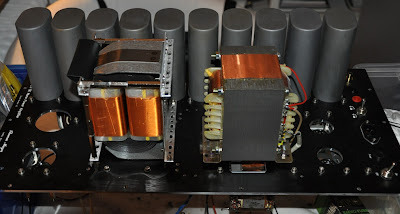 In the photo also the filament transformers are already mounted as well. Two transformers are needed in series simply because no suitable transformer was available with the required voltage. The transformers provide 10VAC/5A each. Due to the choke input supply and voltage drops across chokes and diodes, about 20VAC are needed. Some pre wiring is already done to the caps. Also some ground wiring is visible. In this photo the tube sockets are already mounted too and some more of the wiring is completed. As can be seen, the B+ power transformer and also the output transformer are already mounted as well. The output transformer needed to be mounted sideways, otherwise it would not fit under the transformer cover. A frame construction was necessary to firmly hold the OPT. The sockets of the 6HS5 driver and 6CG3 rectifier tubes are not directly attachedto the metal plate. They are a bit recessed below the plate. This is to have larger creepage and clearing distances from these sockets to any metal parts. The high voltage present on some of the pins makes this necessary. Part 3 of this series of articles will show the completed mono amps in their wooden frames and describe the testing and first listening. This album was recorded 1967 under the Blue Note label. This record is full of groove, soul, drive and a bit of bluesiness. My favorite track is 'One cylinder'. This track stands out in the unique way it lays down the rythm. 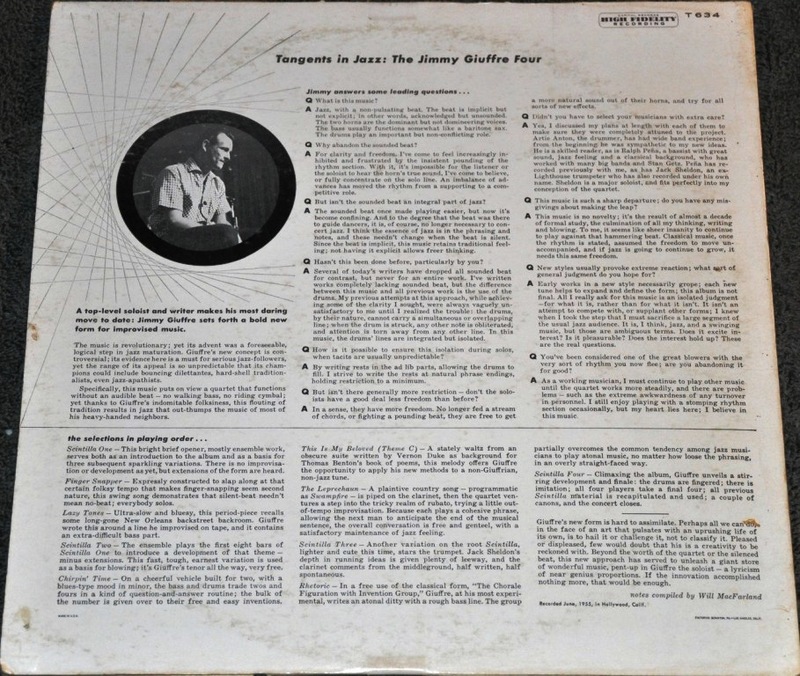 I mentioned in my last article about music, that I'm going to write about more pieces which experiment with the beat. 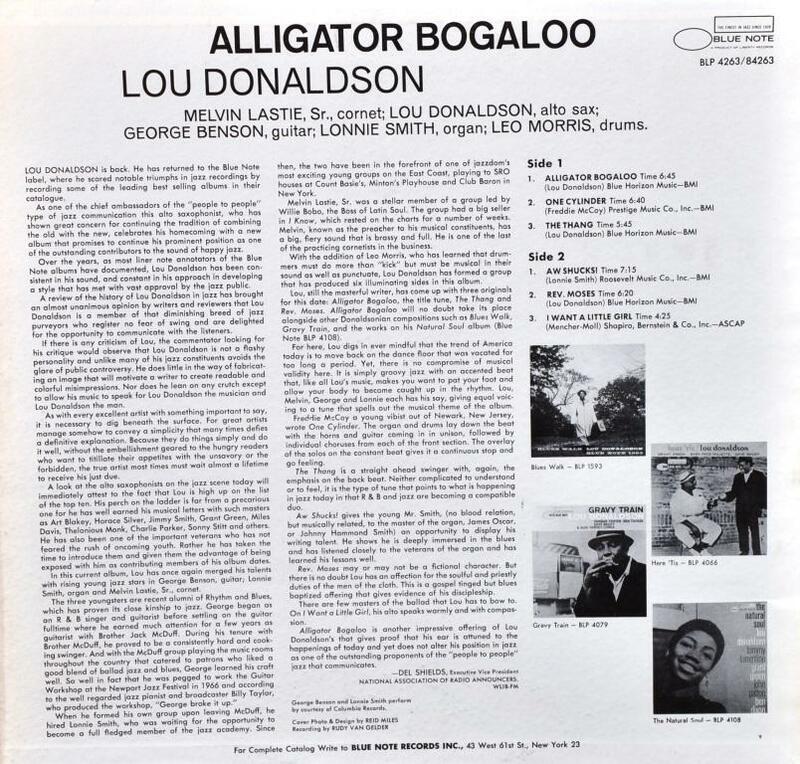 Lonnie Smith who plays the organ provides the beat by playing just a single key throughout the entire piece. With just a little support from the drums. The beat he lays down is so throbbing and full of drive, it is hard to keep the feet still while listening to this. He puts so much passion and variety in it and still plays just one note. Hence the name One Cylinder. 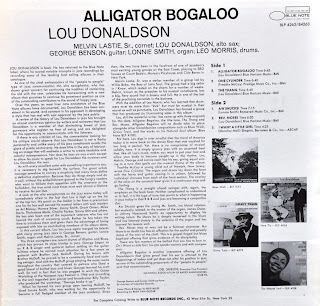 In terms of recording quality this is the typical early Blue Note sound which was created by the famous Rudy van Gelder. A bit on the dark side, beautiful mids with all the varity in colors of tones. The treble a bit recessed but not too much. What Gelder especially captures nicely is the dirty Hammond sound and the electric guitar. The guitar notes played by George Benson have such a beautiful tone and twang. They creep right into your ears and give you a sweet tickle. A timeless master piece in terms of music and recording quality! Many people know me for my LCR phonostages and directly heated line preamplifiers. 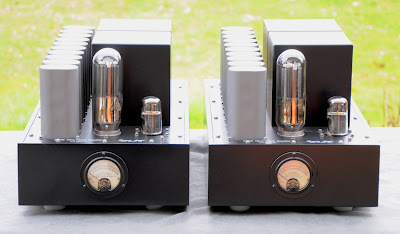 After I published the single ended amplifier concept based on the 6CB5A, the wish for a simpler preamplifier came up, which would match to this power amp both sonically as wells as in terms of materials cost. 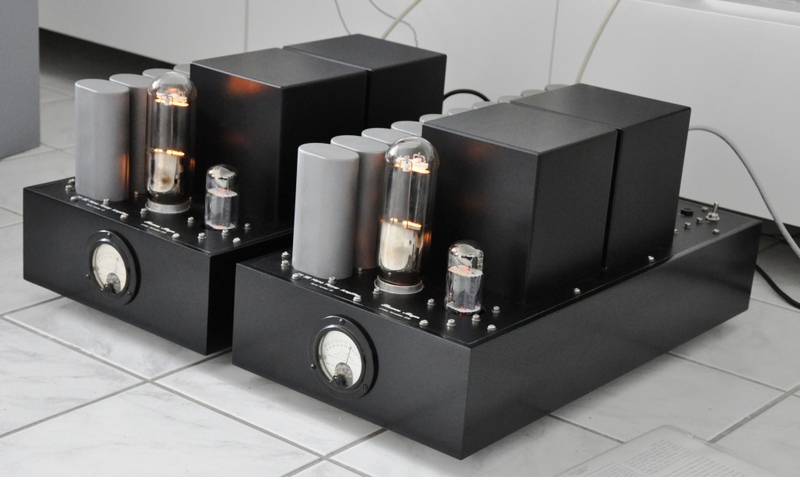 To achieve this goal a fairly common phono architecture was chosen, a RC coupled circuit with passive split RIAA, using commonly available and reasonably priced tubes. Since the 6CB5A amp already introduced transformer coupling, this concept was carried over to the preamp as well. At least into the line output stage. This would provide a low output impedance and the option to use a transformer volume control. The tube choice was somewhat inspired by JC Morrison's Siren Song preamplifier which was presented in an article in the Sound Practices magazine in the 90ies. Also the passice split RIAA approach is shared with the Siren Song. But this is were the similarities end. 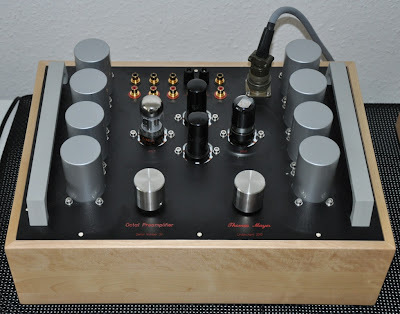 While the Siren Song hat a differential front end, this preamp should be all single ended. In the first stage the 6SL7 provides a lot of gain to bring up the phono signal to a reasonable level. The first stage drives the 75uS part of the RIAA network. After that a stage with paralleled halves of a 6N7 further amplifies the signal and drives the 318/3180uS network. These two stages provide about 40dB gain (20dB loss in the RIAA EQ already deducted). A final stage with a 6SN7 driving a 4.5:1 Lundahl LL1660 line output transformer amplifies the signal by another 12dB and provides a low 350 Ohm output impedance. This is sufficient gain for MM cartridges. For MC a suitable step up transformer needs to be used. This is best directly integrated into the preamp. A suitable and very nice sounding MC step up is for example the Lundahl LL1681. Depending on the step up ratio, which can be chosen between 1:13 and 1:26. The overall gain of the preamp can reach well over 80dB, enough even for MC cartridges with very low output voltage. In order to minimize capacitors in the signal path, all cathode resistors are unbypassed. The last two stages are DC coupled and the output stage uses an ultrapath cap. 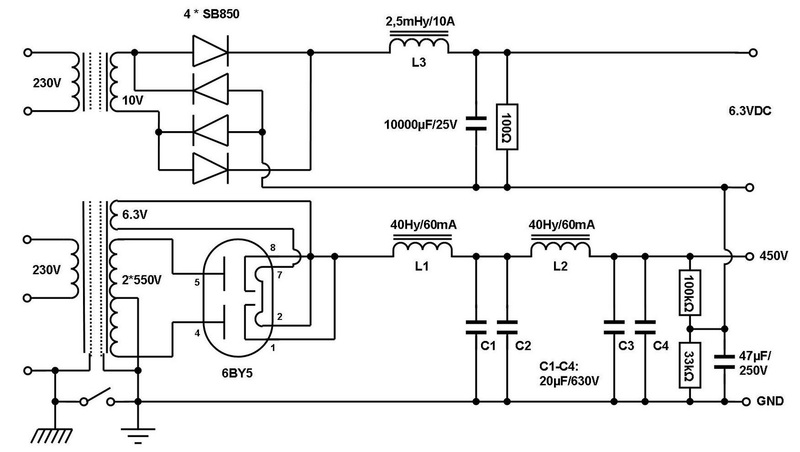 If you only have an analog front end, this circuit is optimized for this purpose. But like this it is a bit difficult to get an entry point for line level sources, since the output stage is DC coupled. We will see how the circuit can be changed to enable switchable line inputs later. First let's discuss some further aspects of the design. How are the RIAA components calculated? The 75uS network provides a corner at 2122Hz. It gives a constant roll off of 3dB per octave from that frequency on. The filter which achieves this is a simple RC network, the resistance multiplied by the capacitance results in 75uS. But if you multiply the 200k series resistor with the 150pF, you get a different value. This is simply because the output impedance of the driving stage (this is the plate resistance of the tube paralleled by the plate load resistor) is in series with this resistance and needs to be added. Also the grid to ground resistor of the following stage plays a role. This is in parallel to the series resistance. Another component which is not directly visible but plays a role is the miller capacitance of the following stage. It is in parallel to the capacitor in the network which needs to be reduced in size accordingly. Unfortunately the datasheets of the 6N7 don't give electrode capacitance, probably because it was not intended for RF use which requires this information. So the actual cap value for the RC network was determined by measurements in circuit. As you can see, both the miller capacitance of the second stage as well as the plate resistance of the driving stage are a significant part of the RIAA network and will influence it's accuracy. This could be seen as a weak point, but this compromise was made intentionally. One way to reduce this dependency would be to use a lower impedance RIAA network, then the miller capacitance of the second stage would be negligible. But a lower impedance network in turn would require a driving tube which has low plate resistance. Such tubes either have low gain or high transconductance. 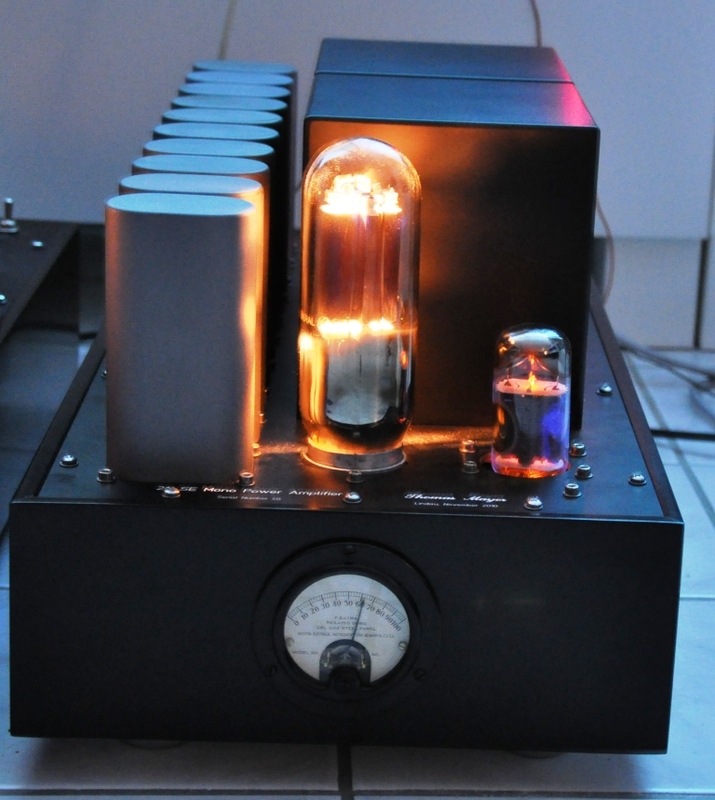 Low gain tubes are not really suitable since we want a lot of amplification in the first stage. High transconductance tubes typically tend to oscillate without suitable counter measures, therefore they where ruled out as well. There is a series resistor to the cap to ground in the 75uS network. The purpose of this is to add the von Neuman time constant. This 4th timeconstant is not described in the RIAA standard. But it is used in the recording process. The reason is that the recording amplifier cannot increase the amplitude with rising frequencies endlessly, but stays flat beyond a certain frequency. The actual corner frequency was never really defined. It can be assumed to be around 50kHz. 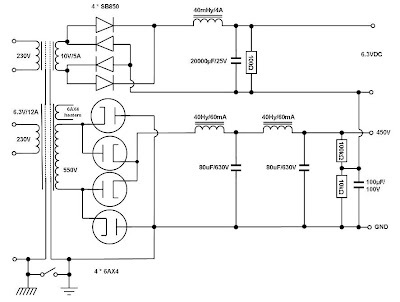 The series resistor stops the high frequency attenuation of the 150pF cap at a certain frequency. However this resistor cannot affect the roll off caused by the miller capacitance, which is a substantial part of the filter network. So it is debatable if it makes sense to have this resistor. I left it in, but did not do any further experimentation there. 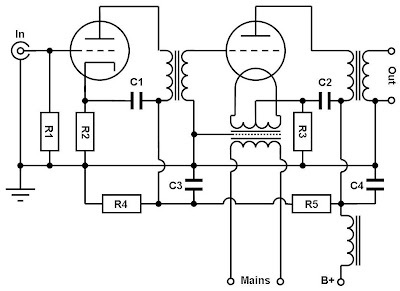 The second part of the filter network is less influenced from it's surrounding circuits. It can be made lower impedance due to the lower plate resistance of the 6N7. The two time constants can be simply achieved by a 100k resistor in series and a 32nF cap in series with a 10k resistor to ground. 100kOhm times 32nF equals 3200uS and 10k multiplied by 32nF equals 320uS. The cap can be formed by some standard values like 22nf parallel to 10nF. With some selection of the caps they can be brought closer to the ideal value of 31,8nF. Again the output impedance of the driving stage and grid to ground resistor of the output stage needs to be considered in the calculation of the series resistor. Best practice is to fine tune the RIAA network in circuit. First build up the circuit without the RIAA network, instead just place a 1:10 voltage divider after the second stage to avoid overload. Then scheck that the circuit works linear without the RIAA network. If it is ok, introduce the networks, possibly one by one and verify and fine tune their correct filter operation. The PSU is a classic full wave rectifier with a center tapped secondary, followed by a choke input filter. The heaters are all wired in parallel and also supplied by a choke input filtered DC supply. To minimize the impact of any residual ripple on the heater supply, it is biased slightly positive by a voltage divider across the B+. This voltage divider acts at the same time as a bleeder resistor. 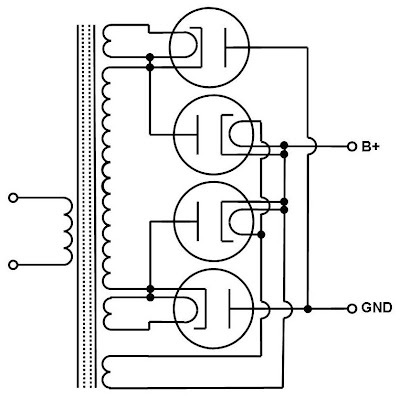 The schematic also illustrates the grounding approach. Each stage has it's local star ground. These ground points get connected with a heavy gauge solid copper wire. The connection between ground and the output is shown as a dotted line. This is an optional connection and can be done according to the system needs. In order to avoid ground loops it can be left open. Each channel is decoupled via it's own choke so the PSU can be shared for both channels. As volume control, I use Dave Slagle's AVCs. To minimze wiring, there is a PCB with relais. But of course it can also be done by routing each signal wire to the rotary switch. The control voltage for the relais is set for 6.3V so it can be conveniently supplied by the heater voltage. As a start, the preamp could also be used with a standard resistive potentiometer and upgraded to a transformer volume control later. 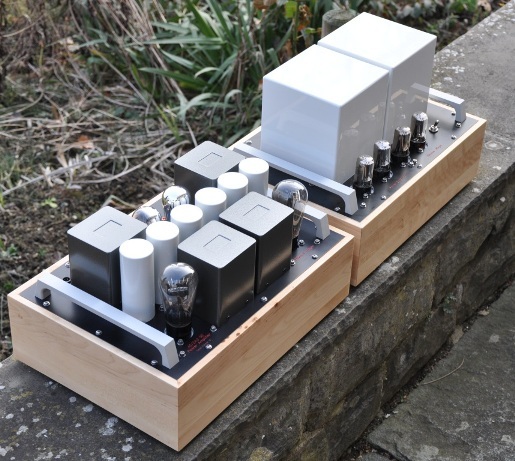 If cost is an issue the preamp could also be built with an RC coupled output stage. 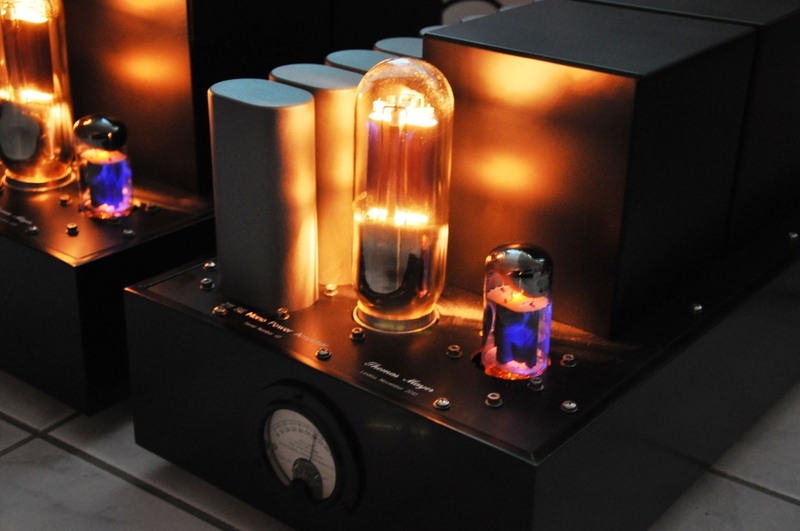 Since all the tubes in the preamplifier share the octal base, the name Octal preamplifier was created. Even the rectifiers are octal base types. 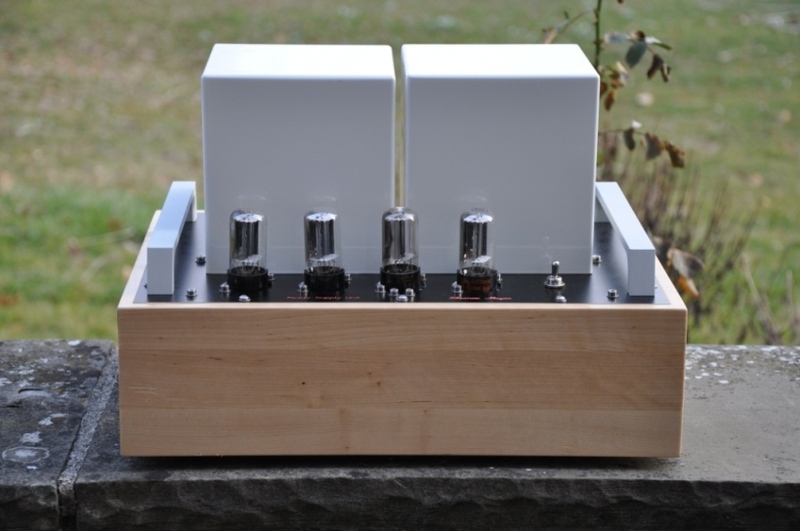 In total the preamp has 8 tubes (1 6SL7, 1 6SN7, 2 6N7 and 4 6AX4). The input and output stage both share one half of a double triode between the two channels. While this is not a real problem (channel separation is an overrated parameter) it can be easily changed. The simplest way would be to just use two each of the 6SL7 and 6SN7 and wire both triode systems in each bottle in parallel. The 75uS RIAA network would require some adaption if this is done and the line output transformer would need to be exchanged for a 18mA type. But since these two are very commonly used in the audio world, I'd also like to use different, less common tubes instead of them. For the line putput stage there is another reason for a change. The 6SN7 even working into a step down transformer provides a lot of gain of about 12dB. With most line sources having 2V RMS output, this is a bit on the high side. We want to have a sensible range on the volume control. So it will be substituted with another tube. The Mk2 version of this preamplifier will be presented in another article. Stay tuned! P.S. : I tried to explain all aspects of the circuit. If anything is left unclear, don't hesitate to ask. A very early album from him, released 1955 on Capitol. This album is quite experimental. What is so unusal about it is the absence of an explicit beat. Although the quartett has a bass and a percussion set, these do not provide the rythm or beat as usual. 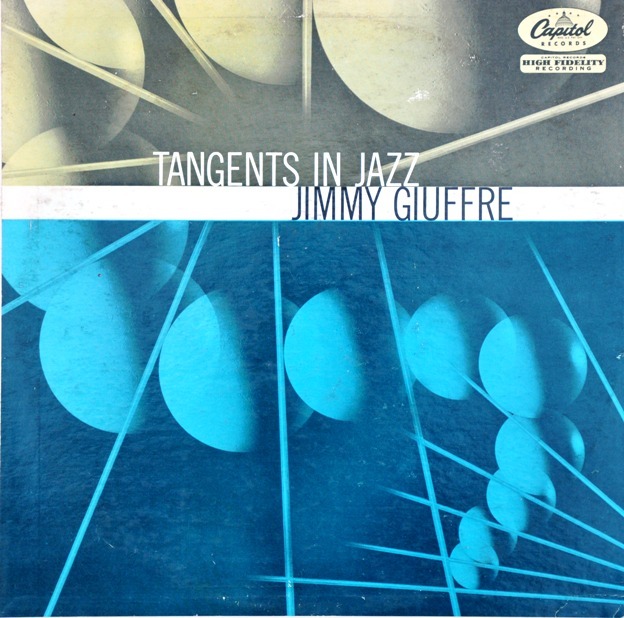 The entire album provides full attention to the notes and phrases and the percussion and bass participate in this. Even with the absence of an explicitly played beat, the music has drive and rythm. Quite fascinating. Being recorded in 1955 this album is from the era before stereo. Dispite the fairly early recording date the technical sound quality is excellent. No hiss, a lot of detail and natural dynamics. Uncompressed and unprocessed pure sound! 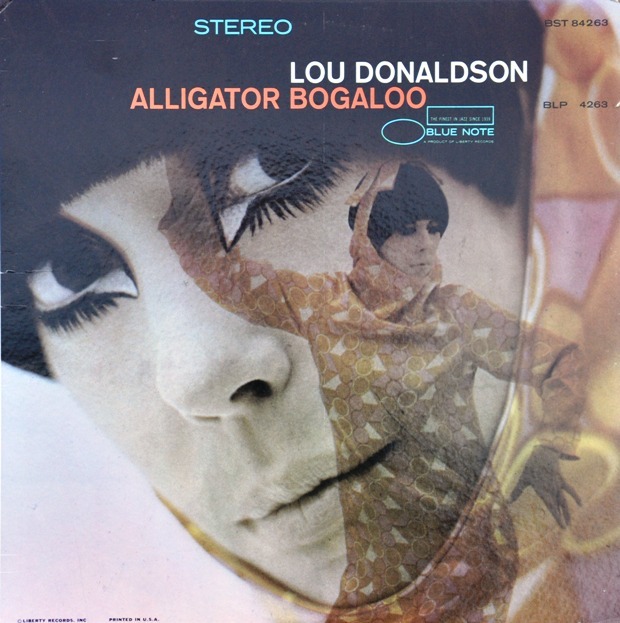 Stereo addicts will be fascinated by the depth of this mono recoding. The instruments have real body. And best of all those beautiful sound colors! A masterpiece in terms of technical recording, innovative music style and passionate playing. This record draws you in. It is playing right now, while I write this article. I like such experimental music which goes different ways. I'll present two more recordings in future articles which experiment with the way the rythm is done. Ever since I started building tube amplifiers, the 211 was among my favorite tubes. In fact the very first power amp which I built used the 211 as an output tube. 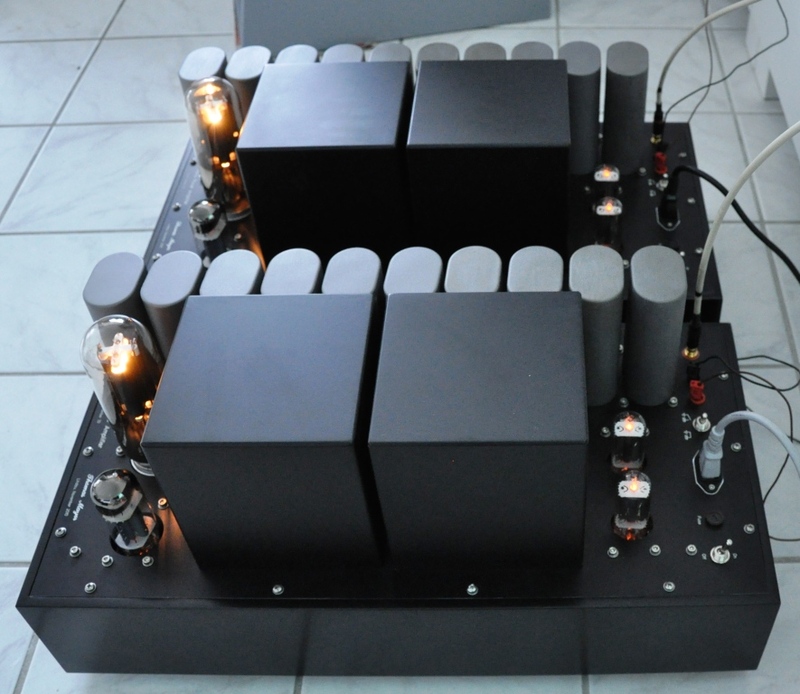 This first amp evolved through several stages and finally ended up in huge monoblocks with 211 drivers and even bigger 3 phase power supplies. Those of you who are familiar with the Sound Practices magazine might have read my articles about this amp and the 3 phase power supplies. After I started to go commercial with my amplifier designs, I decided to build a scaled down version of this amp. It used a single phase supply, and a smaller but still directly heated driver, the 801A. 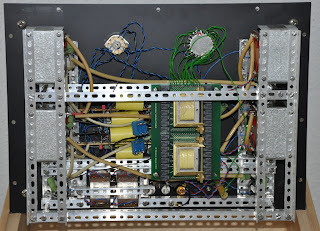 Power supplies were still external so that the whole amplifer ended up in 4 chassis and has a weight of more than 100kg. The 4 chassis in the front row are just one stereo amp! Also the cost of such a 4 chassis beast is quite high. 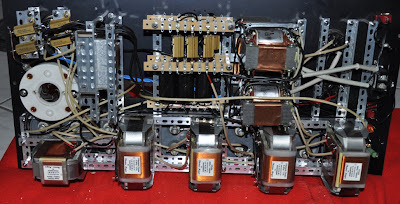 The use of the finest Tango transformers contribute a good part to the overall cost. Also quite significant the expense of 4 chassis. Since the 211 is operated at max B+ voltage, very high quality umbilicals and PSU connectors need to be used which are rated for the voltage, again a cost driver. 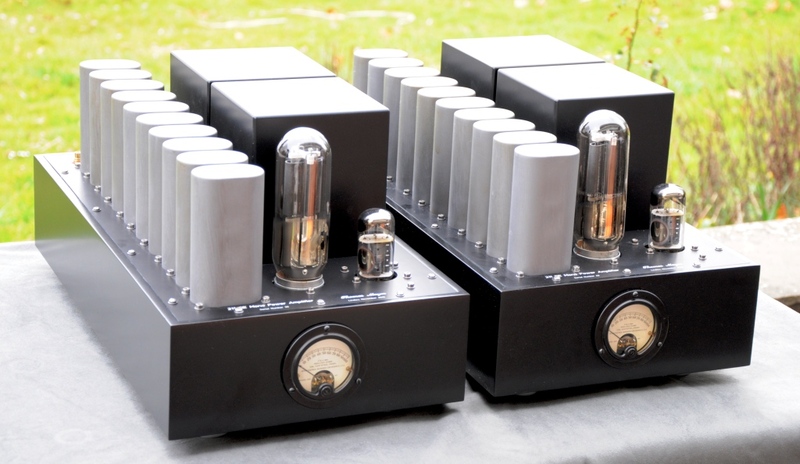 Yet the 211 and 845 tubes are quite popular and many people need more power than can be obtained from smaller tubes. So the idea for a yet further scaled down 211 came up. The actual development of a smaller version was triggered when Lundahl announced the availability of a new output transformer with a high 20k primary impedance, the LL1691B. Twice the primary impedance of the 10k which is commonly used in 211 designs. This should ensure a more linear operation of the output tube and provide a lower output impedance. As mentioned above a big cost driver are the 4 chassis. Also the elaborate power supply with choke input filtered B+ and separate DC supplies for output and driver tubes. Some simplification is necessary there. 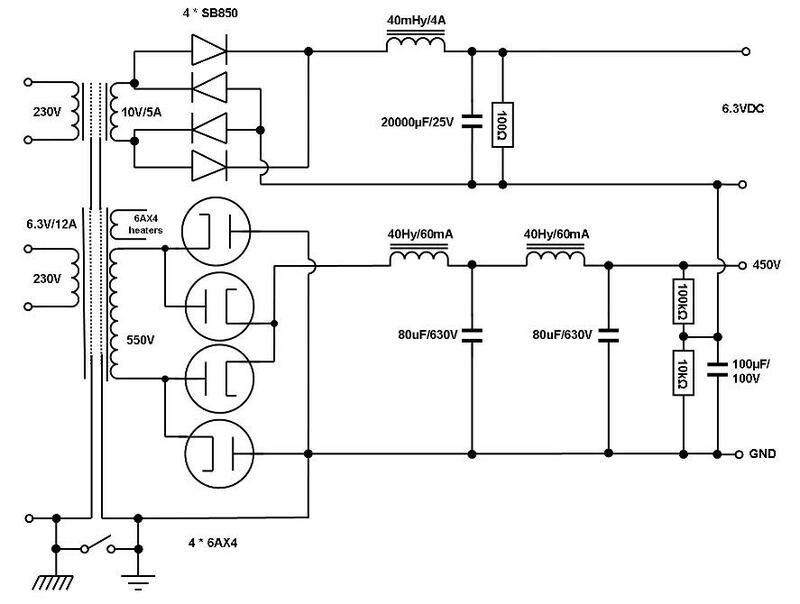 Of course a good way to make the amp simpler is the use of an indirectly heated driver. Possibly a similar architecture as presented in the single ended amplifier concept series. This means a two stage approach. While this is fairly easy with smaller triodes, it is more of a challenge for a 211 if the same level of gain and headroom shall be reached. Since I already had good experience with the 6HS5/6HV5A family of tubes as output triodes (this will be coverd in upcoming articles) I always wanted to use them as drivers too. They have an extremely high amplification factor of 300. Their plate resistance is still in a range which enables transformer coupling. See the datasheet for details. The amplification factor is even high enough so that the interstage transformer can be wired as step down. This should give a nice low impedance driver which even allows the 211 to be pushed into Class A2 territory. A suitable interstage transformer can also be found in Lundahls portfolio, the LL1660/25mA. Even if the interstage is wired in 4.5:1 the overall gain is still enough so that no input transformer is needed as with the 801A/211 or 211/211 versions. This makes the design more widely usable with almost any preamplifier. Normally the high plate voltage requirement of the 6HS5/6HV5A is a disadvantage but since we already have B+ in the range of 1300V for the 211, the supply voltage for the driver can be derived from the 211 output stage B+ via a separate LC decoupling stage. This further simplifies the amp. No compromise should be made in terms of capacitor quality, so no electrolytics in the B+. 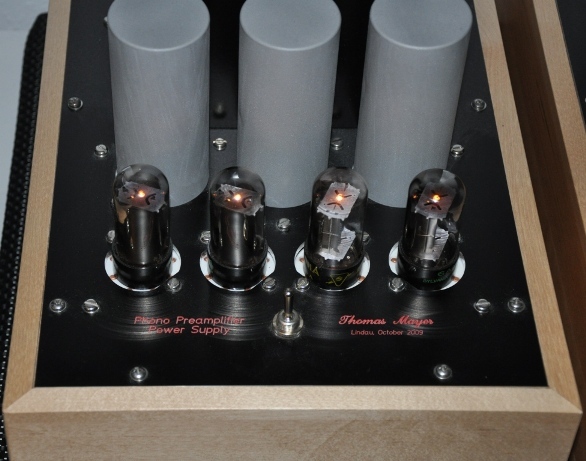 Also the amps should be as hum free as possible, which makes DC filament supplies necessary for the output tubes. Since the DC filament supply has a massive impact on the sound quality, no other approach than the well proven passive LCL filter is considered. As mentioned above, a big cost driver is also the choke input supply for the B+. Especially at these high voltages very massive input chokes are needed since they have to withstand a large AC voltage amplitude across them. Therefore another approach will be used. A voltage doubler supply, but with tube rectification. This enables the use of an existing power transformer, the 400mA universal B+ transformer as was shown in my article about power transformers. Since the driver tube has a compactron base, a TV damper with the same will be used for the rectifiers, the 6CG3. The 6CG3 is one of the strongest TV damper tubes. It is capable of 350mA DC each. In a bridge configuration two of these can deliver 700mA! 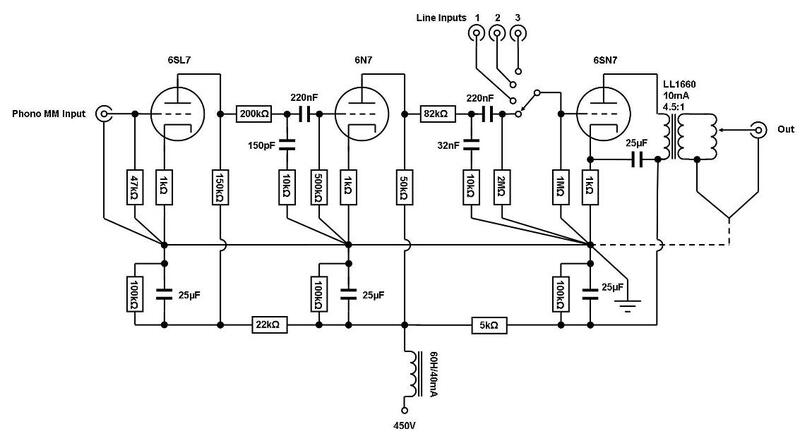 In a voltage doubler arrangement, each rectifier has to deliver the full current which is consumed by the load, still the theoretical maximum of 350mA which two 6CG3s can deliver in a voltage doubler is more than adequate for a mono amp. Although this is a 'scaled down' amp it is still a beast, 4 transformers (output, interstage, B+ and filament) 5 chokes (2 filament, 3 B+) and a large array of paper in oil caps per channel. For the oil caps the same 5uF/2kV types as in the 4 chassis amp will be used. 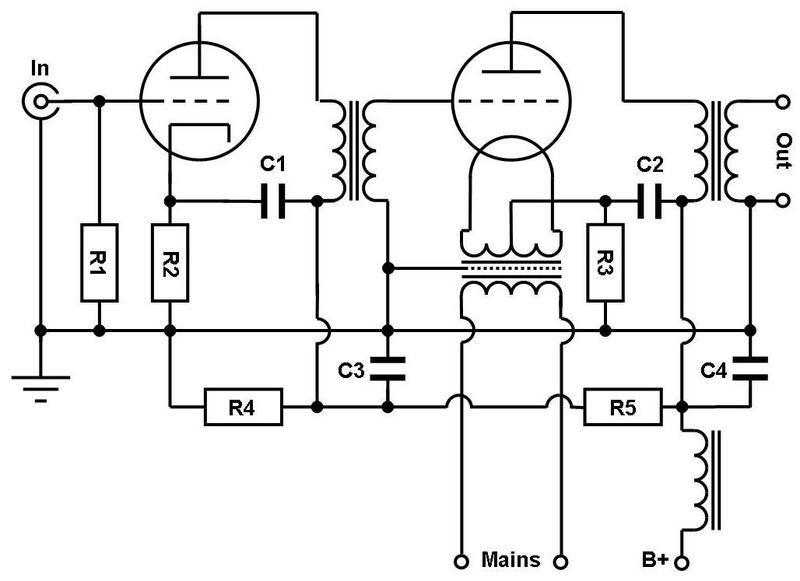 Each 10uF cap value in the schematic will be done with two of them in parallel. No way all these parts would fit into one chassis for a stereo amplifier. The concept will be built up as mono blocks. In the second part the assembly process will be shown. Stay tuned. As you could already read in previous articles, I prefer TV damper tubes for rectification. My favorite among those is the 6AX4. The use of TV dampers in power supplies was advocated by JC Morrison in Sound Practices magazine back in the 1990ies. He mostly uses them as a slow turn on device in conjunction with silicon rectifier bridges. TV dampers have been developed for TV service. Their purpose was to dampen oszillations in the deflection system during the fly back period of the electron beam. This requires a very tough diode which can handle very high peak inverse voltages and peak currents. These properties made them perfectly suited for mains rectification as well. 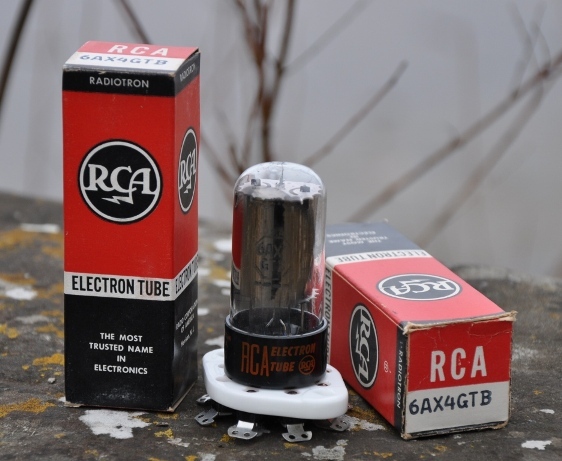 However this was not promoted by tube manufactures since they wanted to continue to sell their dedicated rectifier tubes, which where more expensive. There is still a prejudice against TV dampers as rectifiers because of this. Many years of experience with TV dampers in various power supplies proofed that they are extremely reliable and perfectly usable as rectifiers. Another advantage is their extremely low cost. 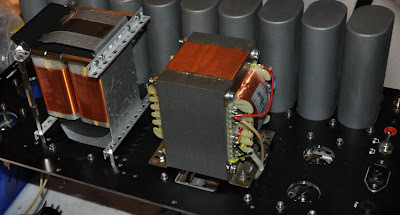 This article shows the assembly process of the power supply unit of the 45/2A3 amplifer which was presented in an earlier post. 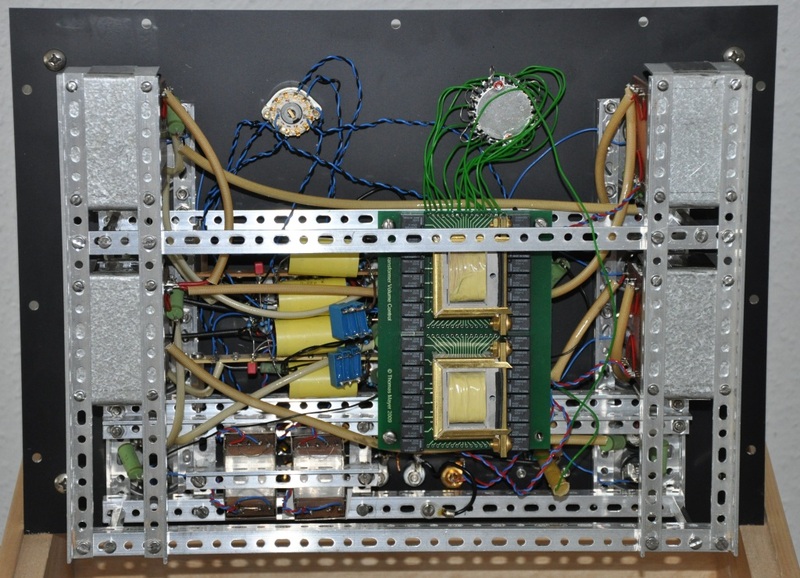 The photo above shows the completed Power Supply. The series of pictures on the left illustrates the assembly process of the PSU step by step. 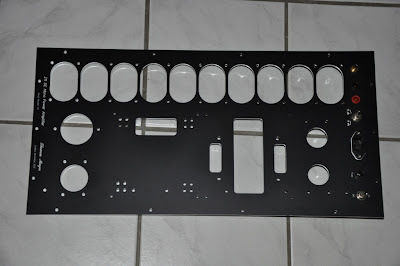 The first photo shows the metal plate which holds all components. It is mounted into an assembly frame. On/Off switch, sockets, B+ power transformer, B+ filter caps are already mounted on the palte as well as fuse holder, connectors for mains and the umbilical. The second photo shows the under side of the plate. Here it can be seen how the caps are fixed. 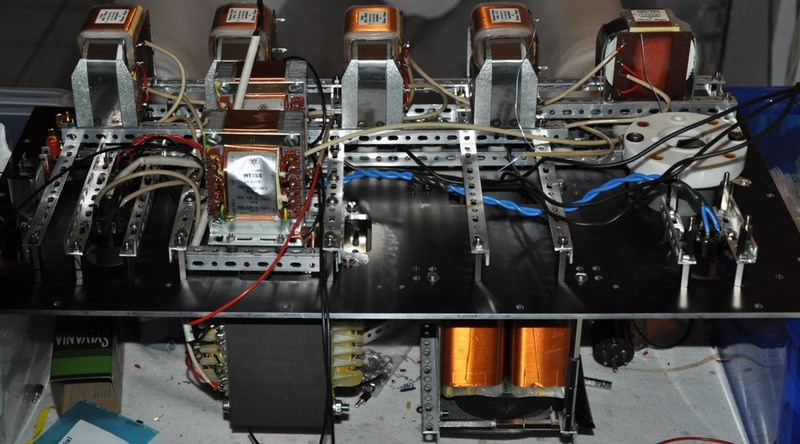 Some initial wiring is already done: Heaters of the rectifier bridge (Graetz) which uses 4 6AX4 TV Damper tubes. Also the high voltage AC from the power transformer to the bridge is already done. All other components are mounted on a frame of aluminum profiles on a second tier. 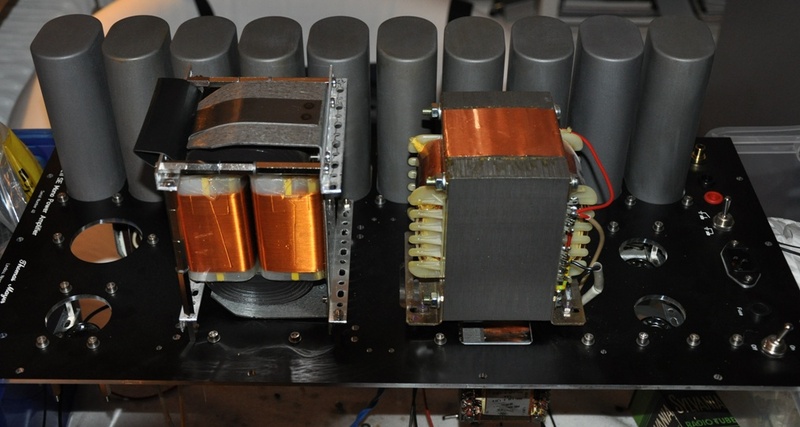 In the third photo the chokes and filament transformers are mounted. One filament transformer for each of the driver tubes (switchable between 26 and 10Y or 801A). B+ is smoothed via a choke input filter with two LC sections. Filament supplies are LCL filtered. The first LC section is placed in the PSU, so 2 filament chokes, one for each channel. The last photo on the left shows the completed wiring of the inside of the PSU. Rectifier bridges for the filament supplies have been added, using Schottky diodes. Each filament choke is followed by 40.000uF smoothing capacitance. 4 10.000uF caps are wired up in parallel on each side. The PSU is ready to be fired up and tested. The sound of this all DHT amp is fantastic. The 26 complements the 45 very well. Depending on taste or mood, the driver can be exchanged for the thoriated tungsten filament 10Y / 801A family tubes which give increased resolution, especially in the treble. This amp is supposed to be used in an active 2 way set up. It will power a midrange / treble horn. But the amp can be used full range as well. Currently no input transformer is added. This way the amp has very low voltage gain (about 0dB). This fits perfectly to a 2-way system with an highly efficient horn and less efficient bass. Not much level adaption to the bass is necessary, just some minor fine trim in the crossover between preamp and power amps. This is a generic schematic which shows how this can be adapted to DHTs like 45, 2A3, 300B, etc. The driver stage can stay the same as in the 6CB5A version. The main point which is different is the cathode of the output tube which is now directly heated, that means the filament itself becomes the cathode and thus is in the signal path. So it needs to be handled with some care. DHTs can be heated with AC or with DC. The schematic shows AC heating which is the simplest form and can easily be done such that the filament supply has no negative impact on the sound. This is much more difficult in the case of DC heating and will be covered in a later post. AC heated DHTs have one draw back: There will be some remaining hum. Often hum bucking pots are seen in these cases. However we want to avoid such an ugly pot right in the signal path. This requires a filament transformer which has center tapped windings. This center tap becomes the cathode connection of the tube and is hooked up to the cathode bias resistor. It is also the connection point for the ultrapath capacitor (C2). This method does not allow any hum adjustment and relies on symmetry of the filament winding and the filament itself. Hum level can vary a bit from tube to tube. Very well suited for this scheme are the 2.5V filament types like the 45 or 2A3. Residual hum will be negligible with these. With 300Bs, hum level could become too much with this scheme as they are heated with 5V. I personally prefer DC heating for 300Bs for this reason. With 45s and 2A3s I stick to the AC scheme as pictured. As mentioned already, the filament supply is very critical. Any noise present here will be injected into the signal. For this reason the filament transformer should be of high quality and have a screen between primary and secondary sides. As usual I even use transformers with two screens. The filaments should be supplied from a separate transformer. The filament windings should not be on the same core as the B+ windings. This avoids any switching noise from the B+ rectifier to be injected into the filament circuit. In a stereo amp, both windings for the two channels can be on the same transformer. 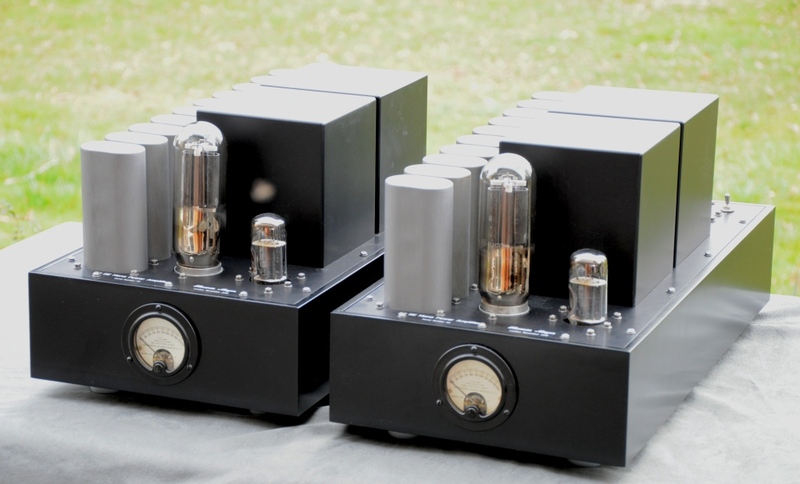 Even if the power supply of the amp is separated into an external chassis, the filament transformer for the output tubes should stay in the amplifier section, close to the output tubes. 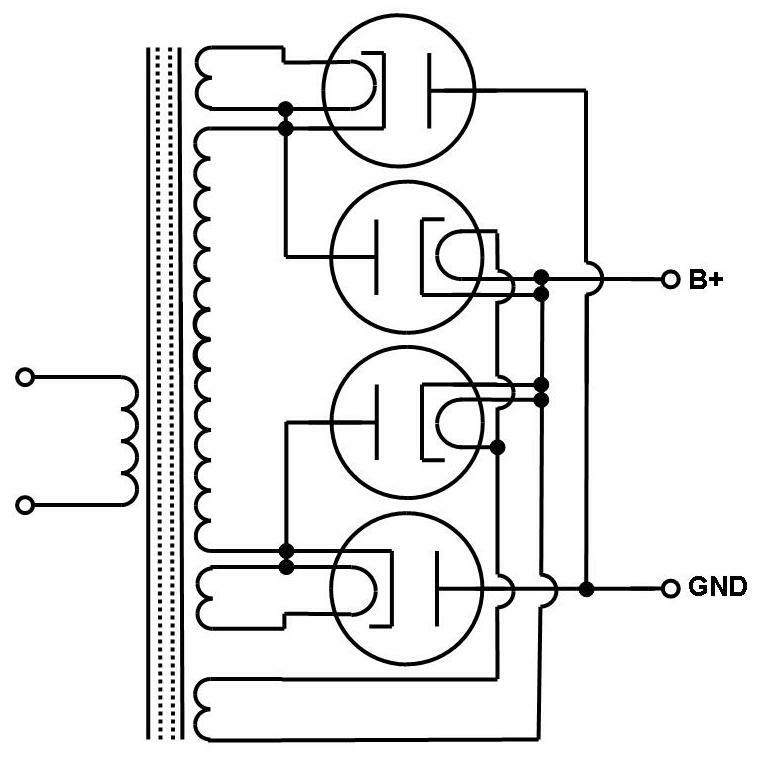 The rest of the schematic is the same as shown in previous posts. The interstage transformer needs to fit to the driver tube. Again the 6N7 works nicely with a LL1660/10mA driving small DHTs like 45 or 2A3. For the 300B it is advisable to use the beefier 6J5 instead of the 6N7. The output transformer also needs to be matched to the tube used. For example a Tango XE20S, configured for 5k primary for the 45. Also the Lundahl LL1663 would work nicely. C1 and C2 are the ultrapath capacitors as has been described in previous posts. 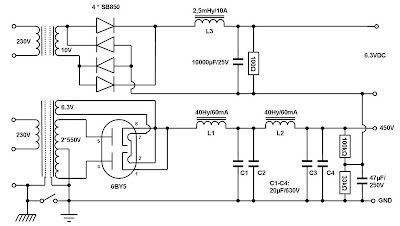 C3 is the B+ decoupling cap of the driver stage. C4 decouples the output stage separately for each channel. R1 is the grid to ground resistor of the input tube and also sets the input impedance of the amp. Values of 100kOhm or 200kOhm are suitable. R2 is the cathode resistor of the input tube which sets it's operating point. In case of the 6N7, 1kOhm is a good value. A 1W rating is sufficient here. R3 is the cathode bias resistor of the output tube. In case of the 45 1.5kOhm/5W would be suitable. It needs to be chosen correctly for other DHTs. In both cases trials with and without cathode bypass capacitors can be made. Depending on the plate resistance of the tubes and the size of the ultrapath cap, a bypass cap can be necessary to avoid early low frequency roll off. 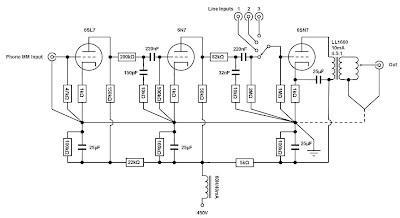 A good starting point would be 25-30uF for all the caps shown in the schematic. The choke decouples the two channels from each other and from the power supply which can be common to both. The current rating of the choke needs to be sufficient, depending on the current draw of the tubes. R5 decouples the driver B+ from the output tube. It needs to be set according to tube choice. R4 forms a voltage divider with R5 and also acts as a bleeder resistor. B+ and the value of these resistors depends on the voltage requirement of the tube chosen. For example a 45 would require around 300V B+. Of course the same RC coupled driver stage which was shown as a lower cost alternative in an earlier post, can be used with a DHT as well. The same type power supply as shown before can be used. The voltages need to be adapted accordingly. In future installments of this series we will see how this concept looks like with DC heated filaments and how this can be modified for an all directly heated amp with tubes like 26 or 10Y in the driver stage.